Someone recently brought my mother a loaf of homemade pumpkin bread and after I inhaled most of it, I can’t get pumpkin-flavored foods off the brain. I’m just so excited fall is here — the mums and fairy tale pumpkins (my new thing) and crisp air and football, all fabulous. I saw these muffins on my friend Jen’s blog and while she is a master baker and takes much better photography than I do, these were still delicious. I need to figure out how to get the nice rounded tops to the muffins like hers (maybe it’s my aversion to the word ‘muffin top?’) I think it might have to do with the fact that I accidentally used a whole can of pumpkin instead of a half can, but oh well. They were still fabulous. And best of all, they were a healthy adapation from a more indulgent recipe, making them a relatively healthy choice for breakfast. Preheat oven to 350 and line muffin tin. In a large bowl, whisk the dry ingredients (flours down through the ground cloves). In a medium bowl, whisk the pumpkin, applesauce, oil, sugar, and eggs together, blending well. Add the pumpkin mixture to the dry ingredients, whisking well until completely blended. Fold in apple. 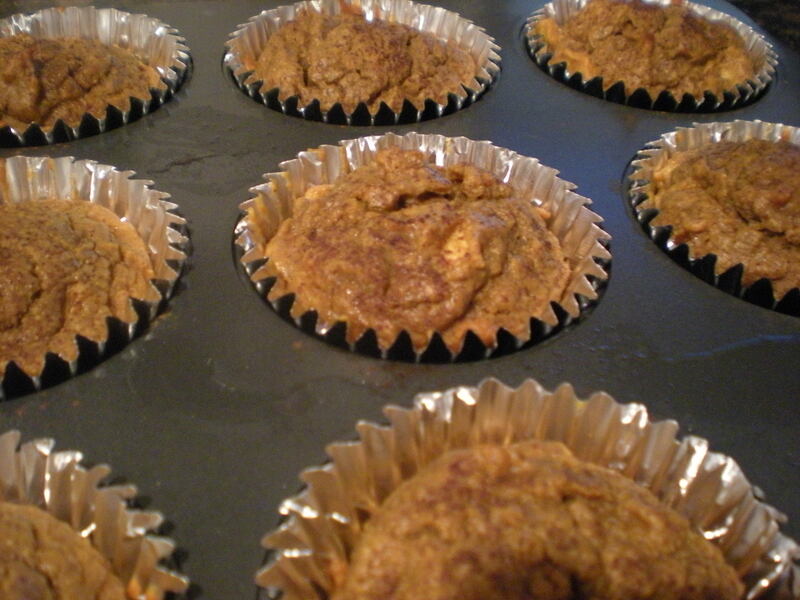 Fill the muffin tins up about 3/4 full and sprinkle with a little more cinnamon and brown sugar if desired. Bake for 23 minutes, or until a toothpick comes out clean. Cool completely before removing from wrapper. Sorry about this, but you really need a waffle maker to make waffles. You can get one at Wal-Mart super-cheap. Mine came from Frank one Valentines Day in college. Totally serious, can you believe that? Awful. Anyways, I’ve been traveling a lot for work recently and on a recent Sunday night, I just didn’t want to DO ANYTHING. But not eating is really not OK with Frank, so I did the most lazy (and delicious) thing I could think of — waffles. Seriously, so easy and they end up looking so professional. Try this weekend! Plug in waffle maker. While it heats, combine biscuit mix, oil and egg in a large mixing bowl and stir well. Add in club soda and mix. Spray both sides — top and bottom — of waffle maker with cooking spray, so the batter won’t stick. 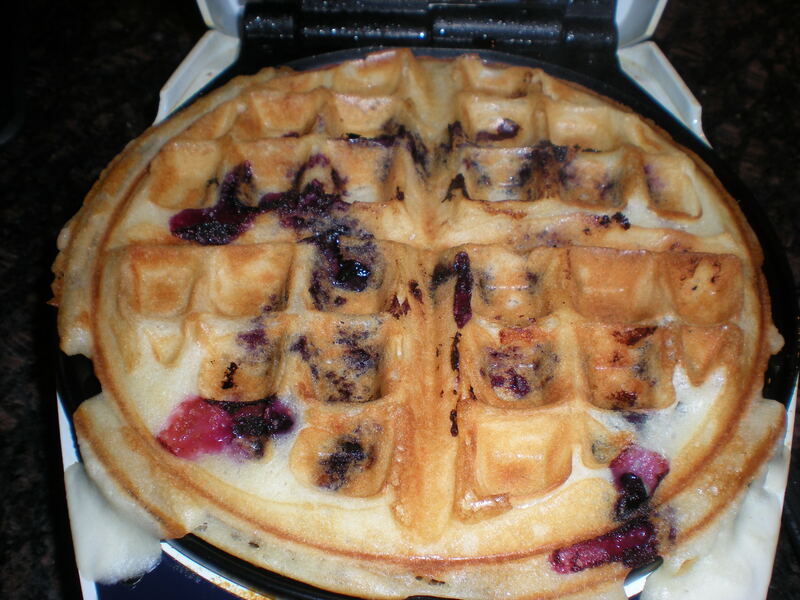 Pour batter onto the waffle maker directly in the middle, letting it ooze and barely cover each section. Be careful not to overfill it, or the batter will ooze out the sides when you close the lid. Toss in a small handful of blueberries into the batter and close the lid. Cook for 5 minutes or until golden. Serve immediately. With bacon and syrup.